But Mary is a persistent cuss. She doesn't take No for an answer. She also knows my weak spot: I'm loyal to a fault to people I care about. When someone I love asks, it doesn't take much for my No to transform into a Yes. Mary and I go way back, all the way to 1989. She produced my very first show in Charleston at the Dock Street Theater. The show that changed my entire life. The show that created my community here. The show that granted me life-long friends. The show that eventually lead me to my husband. It's hard to say No to someone who helped launch that many ships in my life. So I said Yes. I would do the show. But I wasn't going to be on stage. I would sing from backstage. Ok, she said. Mary's cool like that. She knew that once I was through the door, the options were just beginning. I have to confess, I wasn't familiar with Evita. Like most of the Western world, I knew Patti Lupone famous rendering of "Don't Cry For Me, Argentina." I knew some of Mandy Patinkin's vocals. But I had never seen the musical, had intentionally stayed away from the libretto, and had shunned the Madonna/Antonio Banderas movie. Besides, it was classic Andrew Lloyd Webber (ALW) and Tim Rice. I had pretty much left them in the past along with shoulder pads and jelly shoes. Rehearsals started. As with all musicals, we started with vocals. Wow. This music was way more complex than I had expected. I gained a new respect for ALW. Learning lyrics in Latin, Spanish and English along with very complicated harmonies offered a challenge I hadn't attempted in a long time. This was no walk in the park, it was work! Good thing I was just singing backstage, right? Choreography for the first big dance number was arranged without me. That was cool and just what I wanted. Sure, I could use the exercise, but as a marginal dancer I wasn't interested. Just give me my chair in the wings, thank you. Then it was time to block the scenes. I watched from the sidelines studying my music. Scene 1 needed more people and strong vocals, would I be in it? Sure, why not, it's just a funeral scene, anyone can walk up an aisle in all black singing a Requiem, right? Hmmm, the next scene in the cafe was a quick turnaround and needed villagers - no choreography, just acting and singing in the background, will I do it? I guess so- crowd scene improv is fun. As you've probably figured out, eventually I just said Yes to being on stage. Because, frankly - to use a crude term - I am and always have been a stagewhore. Something special happens when I leave the wings and walk out into the lights. I become a bigger, better, freer version of myself. If I was going to do all this work on the music, I sure wasn't going to miss out on being seen! Besides, I was working with a company of good, talented people. They made it easy for me to do what I wanted to do, and to work as part of the unit seemed the right thing to do. We had issues. Sometimes it seemed like anything that could go wrong did go wrong. We had performances during Piccolo Spoleto and up until the final dress rehearsal we were still working on bits and pieces. So much so that I was unsure about inviting people. There is a magical thing that happens in theater. It's probably what keeps a lot of us coming back. No matter how difficult the rehearsals have been, when opening night comes and the adrenaline is flowing and everyone is nervous with anticipation and fear, things just seem to come together. There's a reason for the superstition "A bad dress rehearsal foretells a good opening night." I can't explain it, but it happens. It isn't good to rely on the magic - better to put in the work and planning beforehand - but when it occurs you just thank God and roll with it. We went on to perform to sold out houses during Piccolo Spoleto. Now we are reprising the show at the Dock Street Theater for two weekends. Who doesn't love the Dock Street Theater? I'm particularly glad to be in this venue again. I haven't performed here since the renovations were completed. It's like coming home. The changes are amazing, especially the new dressing rooms. I have to say I do miss the iron staircase that went from the stage to the (old decrepit poorly lit) dressing rooms. But other than that, this is definitely an improvement! Again, we have had some difficulties. We've lost some cast members (including my German daughter Maria, who was fabulous in the first run!) and we've added some new ones (hello to my cousin's girl Samie - nepotism is alive and well in the theater world). There are new set pieces to roll and fly in. There is an orchestra pit instead of an onstage band. It's a bigger house and a bigger stage. The online ticket venue was up and down, until recently mostly down. And it's a new production company without much visibility. Thank goodness quality live theater does not depend on a perfect path or a flawless cast or a pain-free process. Those things are nearly unobtainable in theater as well as in life. The story of Evita illustrates that. But good theater can and usually does include quirky people, artistic differences, plans gone awry, messy entanglements, and dealing with the unexpected. That's part of the "live" part. It also includes a lot of hard work, laughter, late nights, collaboration, cantina visits, artistic synergy, and newly forged relationships. That's part of the "live" part, too. During this run, whether we perform for 4 people or 400 hundred people a night, we will give it all we've got. Because every single performance is special. It will happen that one time and one time only. The next time it will be a different performance with a different energy and a different audience. A unique opportunity to use those 2 1/2 hours in time - hours that will never exist again - to move past the journey and forget the world outside while we create something fleeting and meaningful. Pretty good life advice, I'd say. 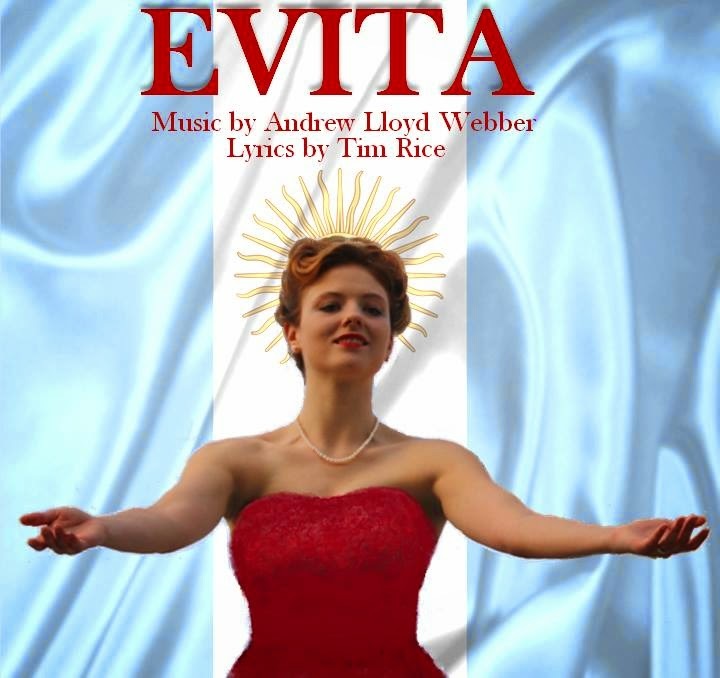 Evita will run at the Dock Street Theater in Charleston SC for two weekends beginning Friday June 27th at 8:00. For more information and to purchase tickets, visit the Evita at the Dock Street website, call the Box Office at 1-800-838-3006, or visit the Dock Street box office daily from noon-5pm.